We’d love your help. Let us know what’s wrong with this preview of Mammoth Books Presents a Clutch of Zombies by Albert E. Cowdrey. To ask other readers questions about Mammoth Books Presents a Clutch of Zombies, please sign up. 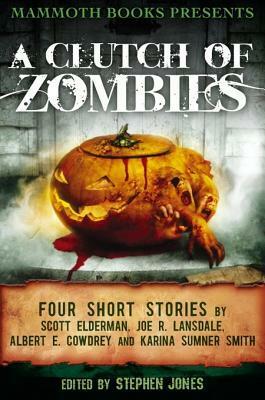 This collection of four zombie short stories is a mixed bag, none are what I would consider a "traditional" zombie story, although Joe R. Lansdale's "Christmas With The Dead." It was a most excellent story. But all of the stories were excellent reads. Only 2/4 of these stories did I find to be good. Christmas with the Dead was worthwhile as was When the Zombies Win (however, I had already read this in The Living Dead 2 compendium). What Will Come After I found to be pretentious and pointless and Fort Clay uneventful and dull. Worth a read but glad it was a quick one. Two of the stories are great; the others are not so hot. I'd recommend the read only to zombie completionists.